A staple item since Karlin Food’s inception, our soup mixes are created with value for your shoppers in mind. We would love to hear from you! If we can be of any assistance, please don’t hesitate to contact us. 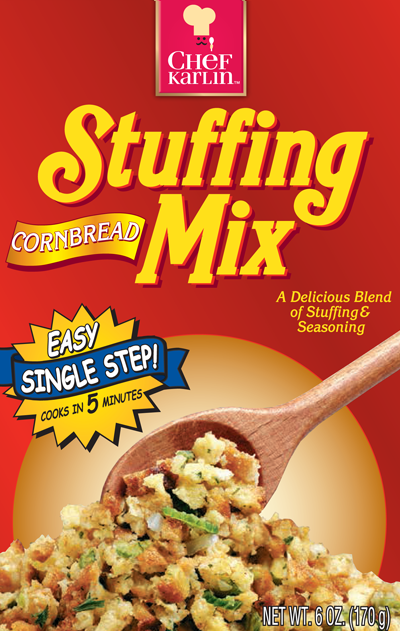 Ingredients: Enriched Flour (Wheat Flour, Reduced Iron, Niacin, Thiamine Mononitrate, Riboflavin, Folic Acid), Corn Meal, High Fructose Corn Syrup, Palm Oil, Salt, Hydrolyzed Corn Gluten, Contains less than 2% of: Celery*, Onion*, Parsley*, Yeast, Soy Lecithin, Annatto (color), Sugar, Chicken Fat, Onion Powder, Chicken Broth, Cooked Chicken, Maltodextrin, Corn Starch, Potassium Chloride, Disodium Inosinate and Disodium Guanylate, Spices, Spice Extractives, Turmeric Extractives (color), Caramel (color), Citric Acid, Calcium Propionate (preservative).